While I was photographing Goldenhills or Brittlebush (Encelia farinosa) flowers, this Arizona Powdered Skipper (Systasea zampa) darted in to get a quick sip of nectar before zooming away. Arizona Powdered Skippers are found here in Arizona and throughout the southwestern US, usually in canyons and washes. These butterflies have an up to 1.5 inch (3.8 cm) wingspan and will usually perch with their wings held open. Arizona Powdered Skippers are very similar to Texas Powdered Skippers (Systasea pulverulenta), which are also found here. 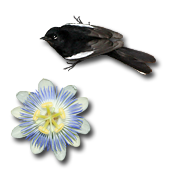 Both species have scalloped hindwings and a transparent median band on the forewings. This band is mostly straight on Texas Powdered Skippers and is noticeably more zigzagged on Arizona Powdered Skippers like this one. 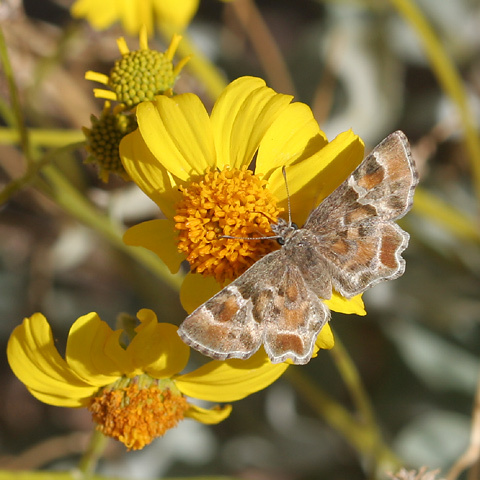 Arizona Powdered Skipper caterpillars feed on plants in the Mallow Family (Malvaceae), and the adults feed on the nectar of a variety of flowers.